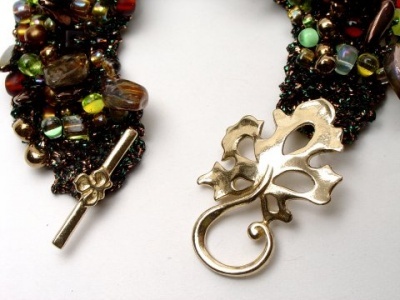 The new clasp, the leaf hook & eye. 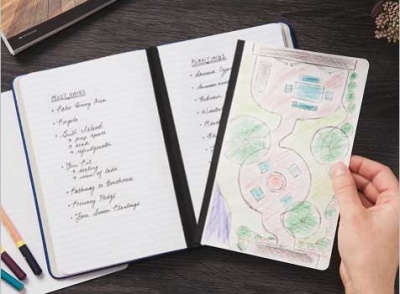 Top photo shows the two parts; bottom is them together. We wanted a bead stew bracelet to reflect the deep quiet of the Northeastern forest in mid-summer, when the leaves are so thick and the trees do deep that you can't even see the sky. 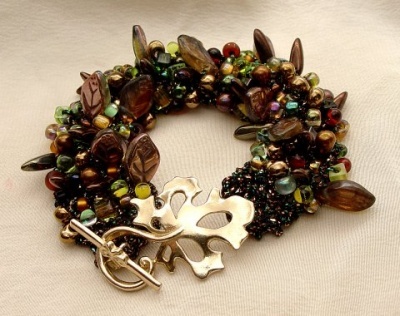 This bracelet uses greens and browns in as many sizes and shapes as we could find --- daggers and leaves and tear drops and megatamas and seed beads and triangles and -- need I go on? A bracelet worthy of Gaia. We threaded these on a wonderful green-brown marled thread (though your kit could easily have thread of deep green or rich brown ) and started to knit. You can almost smell the loam. 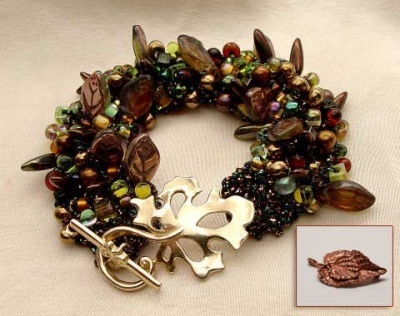 The clasp has been changed for this bracelet as the lovely leaf you see in the photo is no longer available. 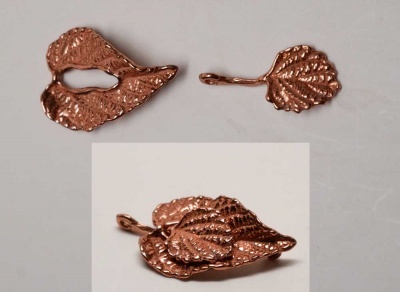 What we have for the kit at this time is a very interesting hook-and-eye type clasp of copper. The "eye" part of it is a leaf with a hole in the center and the "hook" is a smaller leaf that slides into it. The kit doesn't include the knitting needles. We suggest size 0. 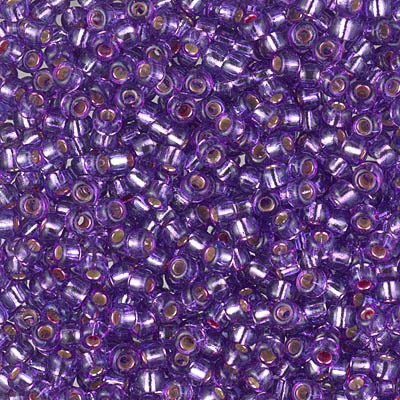 The pattern is the same as for all of the Bead Soup and Bead Stew Bracelets -- you have the option to get it or not via the drop-down menu. Note that the kit will not automatically include the pattern. We offer three options. I know some of you might already have made other bracelets from us that are made along the same lines, the only real changes being the beads and the colors. If you feel you do not need another pattern, simply choose "No Pattern Needed." If you would like a printed copy, please make sure the "Pattern" drop-down menu is set to that. We also can email the pattern to you, though I have to do it manually and usually send it right before I mail the kit (please be patient). Just make sure that drop-down menu is set as you would like before you check out.